Iraqi riot police prevent protesters from storming the provincial council building during a demonstration in Basra, Iraq, July 15, 2018 (AP photo). 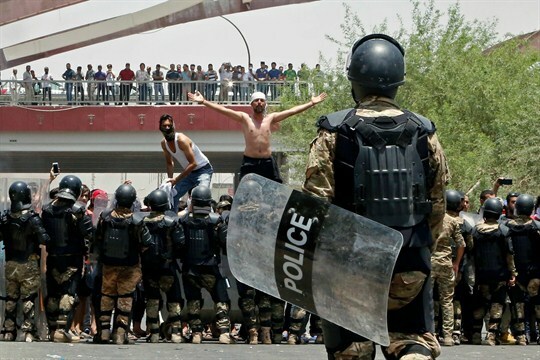 In what is becoming a summer ritual in southern Iraq, protesters took to the streets to voice their grievances amid scorching heat over the course of the past several weeks. Their government’s inability to provide basic services, namely electricity and water, makes the harsh summer unbearable to many Iraqis. The high unemployment rate means that many cannot afford a basic standard of living.